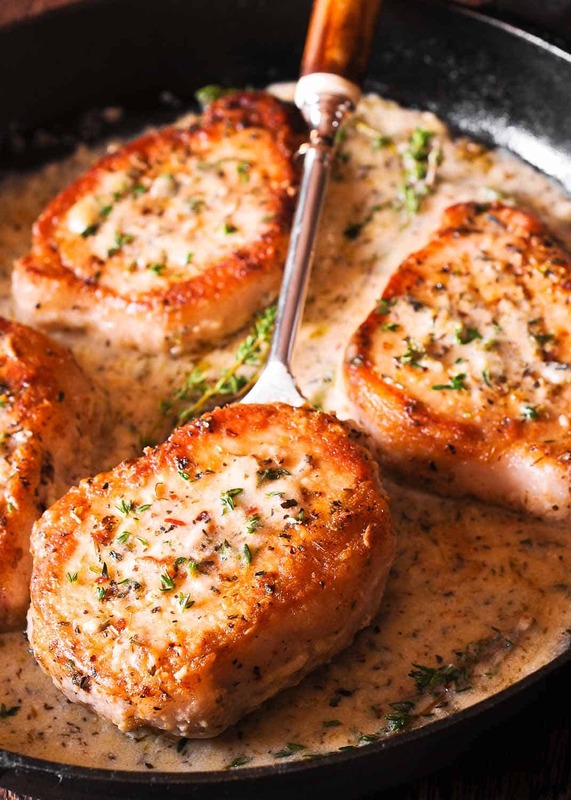 Delicious Boneless Pork Chops in Creamy Garlic & Herb Wine Sauce made with dry white wine, juice of a fresh lemon, garlic and thyme. Dredge pork chops thoroughly in the dry mixture, then heat 2 tablespoons butter in a large skillet over medium-high heat. Once hot, add pork chops and sear them by cooking for 3-4 minutes per side for a total of 6-8 minutes. The first side is cooked on medium high, but when cooking on the second side, reduce the heat to medium. Remove pork from heat and transfer to a plate. Cover to keep warm. Return skillet to heat, add 2 tablespoons butter and minced garlic and cook for 1-2 minutes on medium heat. Add flour to the butter mixture and start pouring in wine while still on medium heat – about 1 minute. Next squeeze lemon into the pan, add chicken stock and heavy cream. Add fresh thyme and Italian seasoning, season with salt and pepper (to taste). Simmer for 2-3 minutes. Taste the sauce and add more seasoning, if necessary.